If you’re one of the thousands of people looking to setup and run a craft business from home (or if you’re one of the thousands already doing so), there’s no shortage of things to think about. 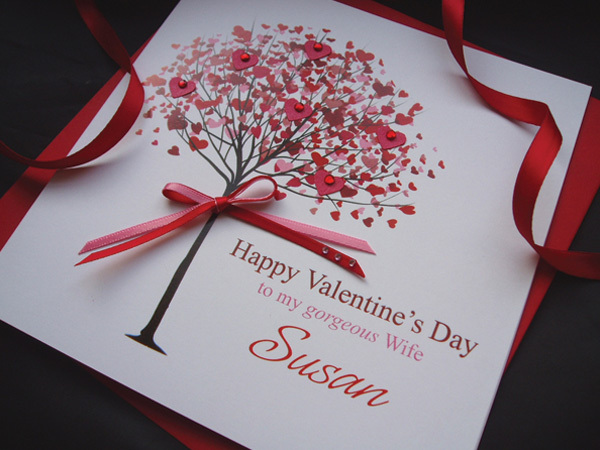 Not only do you have to think about exactly what it is that you’re going to sell (handmade cards, soaps, jewellery, home ware, etc. ), but you also have to figure out how you’re going to stand out in an increasingly competitive and saturated market, where you’re going to sell your product(s), and how you’re going to manage your entire operation. In 2012, a report by Craft in the Age of Change estimated that the crafting industry was worth £457 million annually, so you’d think that the pie was big enough for everyone, right? Perhaps it is, but even if you’re one of the few making money from your craft business already, growing it and taking it to the next level can certainly be a challenge. If you’ve been running your craft business for a while, you might already have a good idea as to the sort of products that you want to create and sell. For example, you might have decided that your craft business will sell handmade jewellery, or soap, or unique gifts, or greetings cards. You might even have already created and sold some of them. This is a great start, as it’s extremely important to have a clear idea on what you’re going to sell, but it’s also important to remember one thing: this is a business, not just a hobby. The reason for mentioning that is that often, us creative people can get carried away when it comes to the product creation process. It’s easy to come up with a million ideas for “cool items” to sell and while some people might get lucky and end up with a big seller on their hands, more often than not, you’ll end up creating some things that nobody but yourself actually wants to buy. So, if you truly want to grow your craft business into a full-time business, it’s extremely important to do your market research and create/refine your products accordingly. While it’s extremely important to create unique and exciting products that stand out from the crowd, you can learn a lot by looking at products that are already selling well. 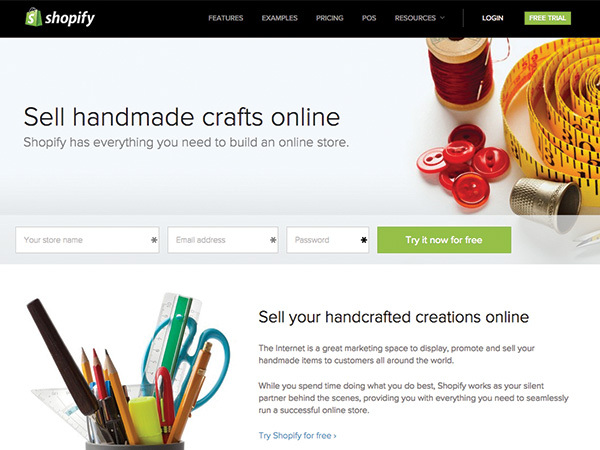 If you’re running a craft business and you’ve never heard of Etsy, you may as well give up now. 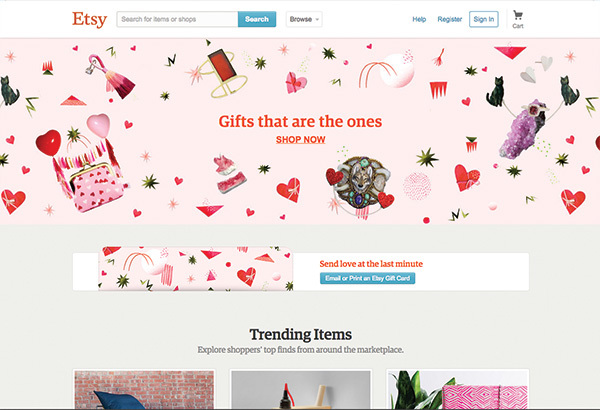 With a community of over 30 million creative businesses and buyers, Etsy is one of the largest (if not THE largest) online marketplaces for anything and everything craft-related. However, if you’ve already listed your products on Etsy, there’s a good chance that you might have experienced limited success. The reason for this is that while there are a bunch of Etsy sellers that experience huge success and sell thousands of products, many Etsy sellers only ever sell a few items. Why? Because only a handful of sellers are selling unique items that the Etsy community are actually interested in buying; most others likely haven’t done their market research. So, the trick is to use Etsy’s huge success to your advantage and to reverse engineer the products and sellers that have the most success, then use this information to create and refine your own products. 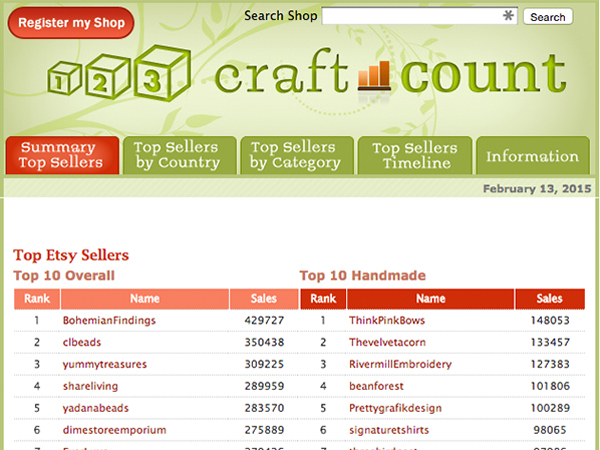 CraftCount.com is a website that tracks Etsy top sellers by category and country. So, basically, you can use this website find the most popular sellers in your niche and get inspiration from the products they’re selling. 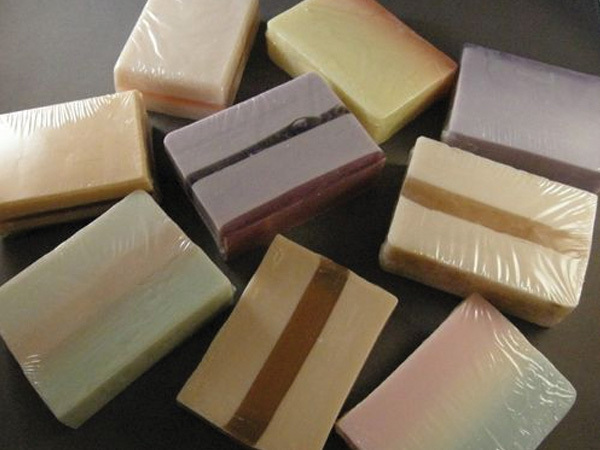 Let’s say that you want to set up (or already have set up) a craft business selling handmade soaps. 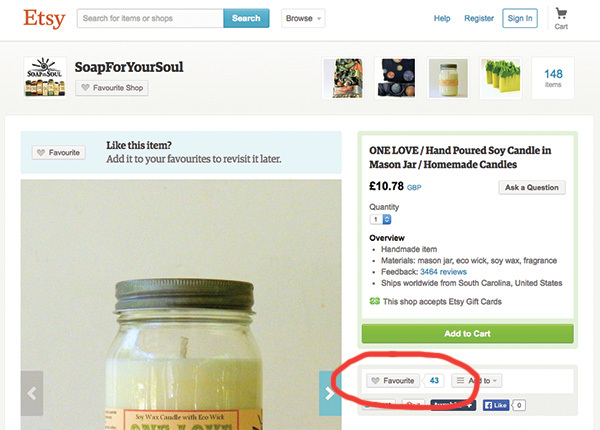 You’d want to find soap sellers that are having success on Etsy and use their products as inspiration for your own products. As you can see from the results, there’s a number of Etsy shops selling soap that already have some pretty impressive sales figures (e.g. soapwallakitchen @ 31,027 sales). Let’s investigate this Etsy store and see exactly what it is that they’re selling. Click on the name of the shop to do this. It’s instantly obvious that this particular Etsy store is based around organic face and body products. 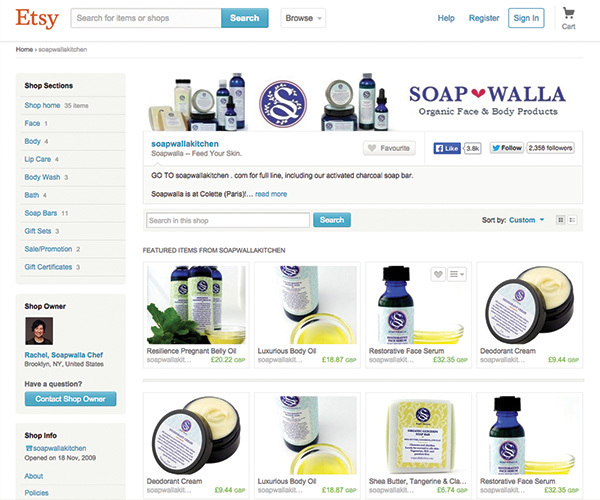 Let’s take a look at another Etsy soap shop that seems to be doing well (3000+ sales). Soap for your Soul appears to be selling handmade soap made “using the finest vegetable oils and natural colorants”. 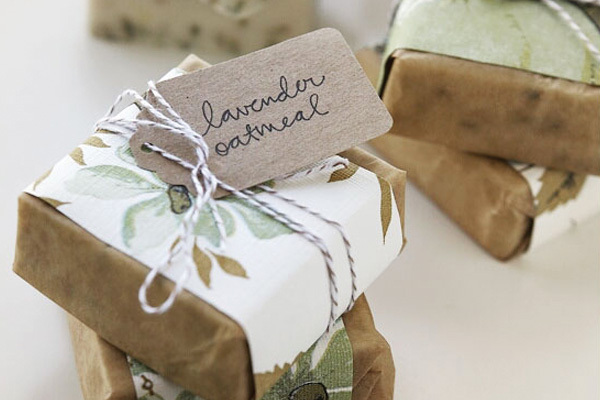 Clearly, for two Etsy stores to be having such great success selling very similar items people must love “natural” and “organic” soap products. 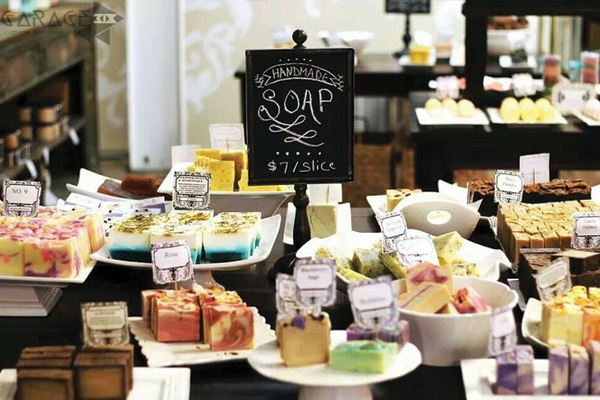 Therefore, we can be confident that if we create a soap business with this USP, we’re likely to appeal to market demand. 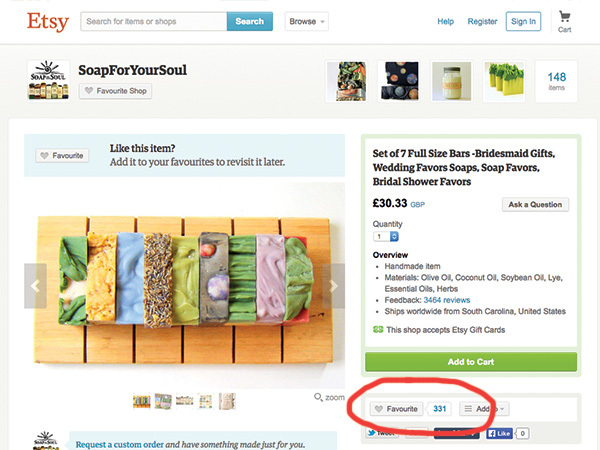 If you want to delve even deeper, you can take a look at each individual product and analyse the “favourite” count. Products with a high number of “favourites” are likely to be the best selling products, whereas the products with the lower favourite counts probably don’t sell as well. Obviously, it’s not just soap that you can use this process with. You could use it with jewellery, gift cards, craft supplies, pottery, anything you wanted. Simply search for a related term on CraftCount.com and go from there. Once you’ve found your items, it’s simply a case of creating similar products with your own unique spin. You don’t want to copy the competition; you simply want to let them influence you. The reverse engineering process is possible to do on EBay too. To start, simply go to EBay and search for the product(s) you’re interested in selling. 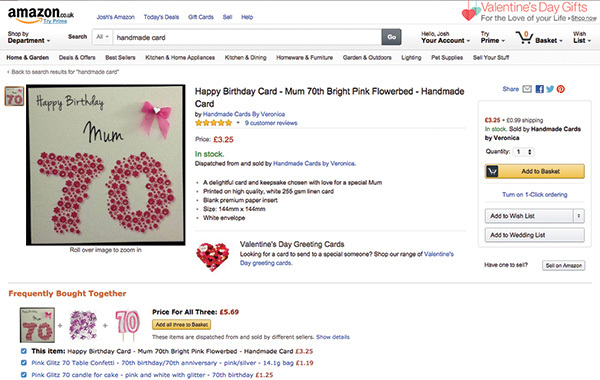 Then, scan over the search results looking for products with a high number of sales (this is presented in big bold red numbers – you can’t miss it). Do this for a few items and you’ll start to see what kind of products in your niche are selling well. Take note of the design style, price, etc. This will help you to make informed decisions when creating your own products. Tip: If you find any products you like the look of, and that are selling like hot cakes, try adding them to a Pinterest board. This will then serve as a visual inspiration guide for your own products. It’s not enough to find and create products that people want to buy; you’ve also got to present those products in a way that makes people actually desire them (enough to actually get out their credit card and make the purchase). In such a crowded marketplace, you’d think this would be easier said than done but in reality, you have a huge opportunity here. Most craft business owners (especially those working from home) put very little effort into their branding and photography. So, with just a little effort and knowhow, you can present your business much better than 99% of your competitors. It really is as simple as that, but so many people get it wrong. As you can see, things are kept simple. There’s plenty of white space, a clearly defined colour scheme (pink, black and white), and most importantly, beautiful product imagery. It’s clean, well-lit, high quality (it’s not pixelated at all) and shows off the product, not the surroundings. Again, it’s clear, well lit, and nicely presented; you certainly wouldn’t guess that a professional photographer didn’t take it. It’s dark, cluttered, low quality, and generally just a poor photo. When you’re running a craft business, photography can make or break your business, especially when you’re listing on sites such as Etsy or EBay as often, your product photography is the one chance you get to really show off what you’re all about. The rest of the page will be primarily Etsy/EBay branded. If you’re still struggling to take decent product photo’s, here’s a great list of resources put together specifically for Etsy sellers. If you’ve set up your craft business from home, selling online via a third party is probably the most logical and low cost way to start selling your products. Selling online requires little investment (none in some cases) and there are very few overheads (especially when compared to a physical store). The problem is, there are so many different sites and marketplaces; it’s hard to know which will offer the best opportunity for growth. You’ve got Etsy, EBay, Amazon, and tonnes of other stores to choose from. So which should you go with? No matter what your particular craft business is selling, you can be almost certain that opening an Etsy store will be a good idea and offer the best opportunity for growth (as long as you do your market research beforehand, as mentioned above). 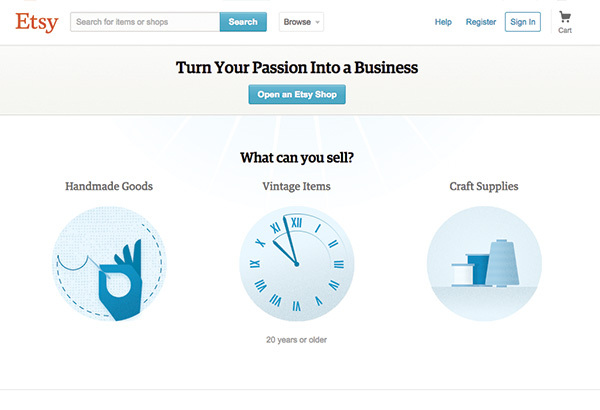 Etsy receives millions of visitors every month, all of which are either buying or selling craft products. Therefore, this is probably the easiest way to get your products in front of your target market so if you don’t have an Etsy store, it’s time to get one. 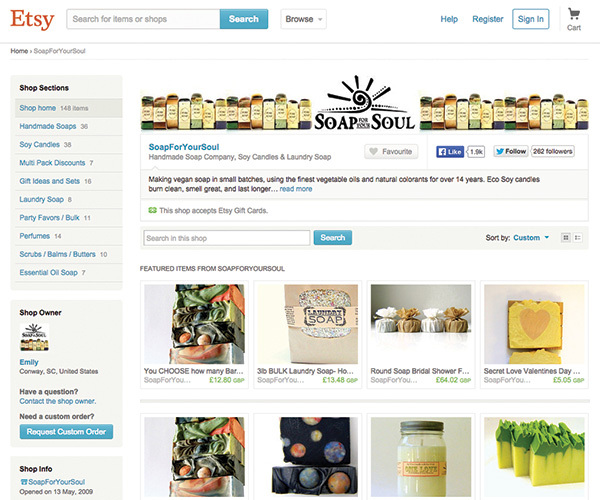 Setting up an Etsy shop is 100% free; no monthly fees, nothing. 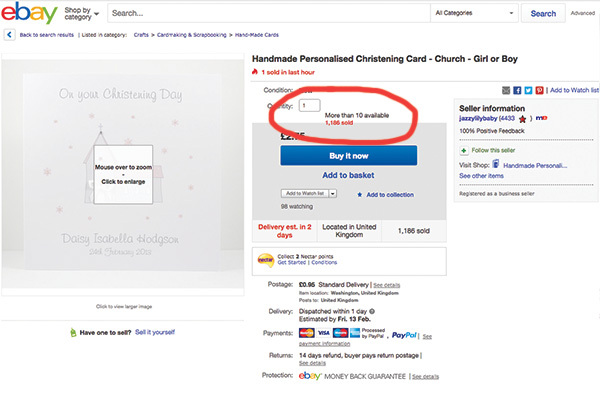 All you pay is a $0.20 (or £0.20 in the UK) listing fee (lasts for four months, or until the item is sold) and a 3.5% final sale fee on any sales. To set up your Etsy shop, follow this link. Then, click the “Open an Etsy Shop” and sign up. 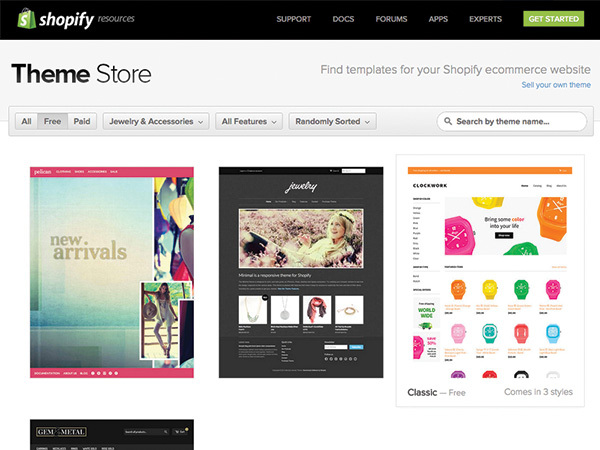 All you need to do here is to upload your images, product descriptions, pricing and so forth, and you’re ready to go. Note: If you really want to maximise your chances of getting found and generating sales on Etsy, it might be worth reading this article. Etsy might be the most obvious place to list your craft items for sale, but it’s important not to forget about the other big names: EBay and Amazon. Much like Etsy, anyone can sell on EBay and Amazon in a matter of minutes and it’ll hardly cost you anything to open a store and get your items listed. EBay listing fees vary but unless you’re selling high value items, it’s unlikely that it’ll cost you more than $0.30 - $0.40 (plus a final value fee if the product sells, of course). 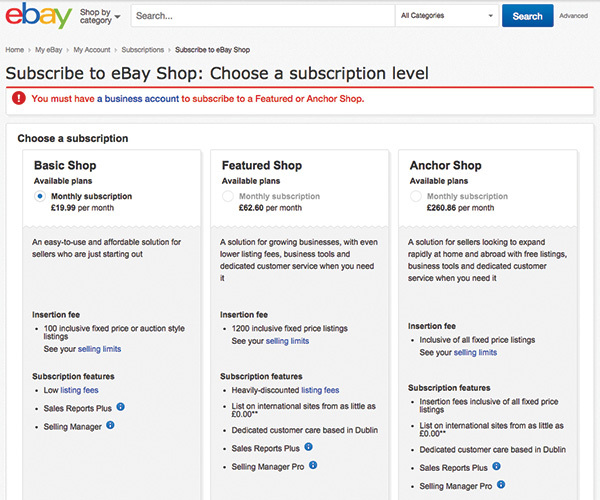 However, opening an EBay shop does cost a minimum of £19.99/month, but it does include 100 listings (so, less than £0.20 per listing). EBay might not seem like the most obvious place to sell craft items but some sellers do incredibly well on there. 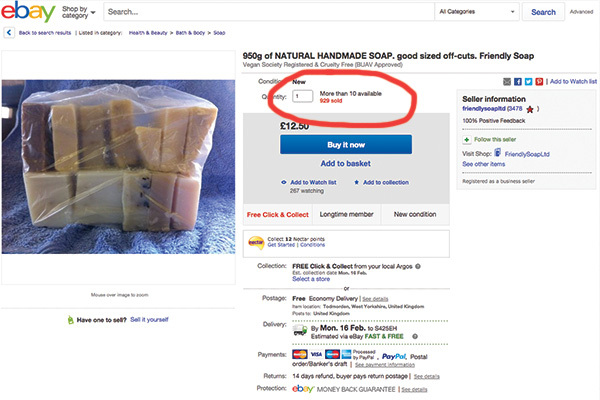 You can see that they’ve sold 929 natural handmade soap bars @ £12.50, bringing them £11,612.50 in revenue from one product alone. Clearly, if you sell the right product, it’s possible to grow your craft business exponentially on EBay. You can set up your EBay shop here. Amazon offers a similar opportunity and much like EBay, the costs of listing products on the site are minimal. Adding your products to Amazon can help to grow your craft business massively with virtually any extra effort. Once the products are added, that’s it. You can start selling with Amazon here. Although Etsy, EBay and Amazon are the ones that most crafters tend to go for, it’s important to remember that with just a little bit of research, you’ll probably stumble across a few other places to sell your product(s) too. 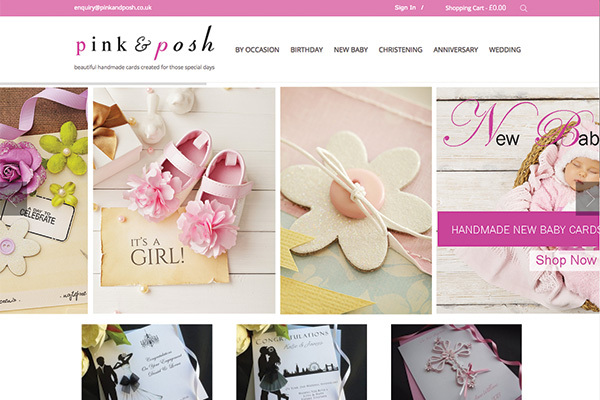 You might have heard of NotOnTheHighStreet.com already, but did you know that it’s possible to partner with them to sell more of your product? You’ll need something pretty unique, high quality and targeted towards their audience to get the go-ahead, but it’s worth a shot as it could skyrocket your craft business if you got featured on the site. 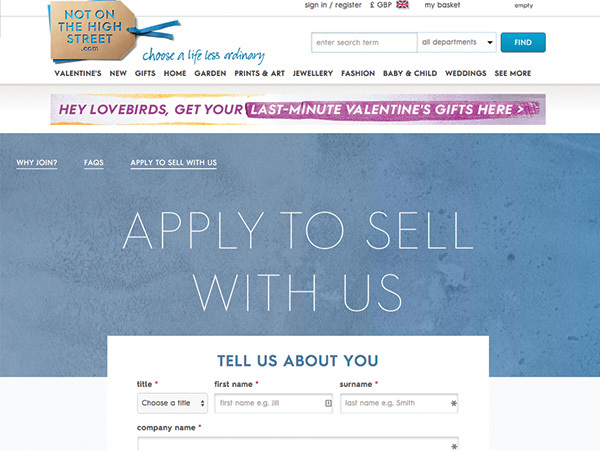 If you’re interested in selling on NotOnTheHighStreet.com, you can apply here. While it might not have quite the level of fame and reputation that Etsy has, Folksy is another fantastic marketplace for selling your craft goods. 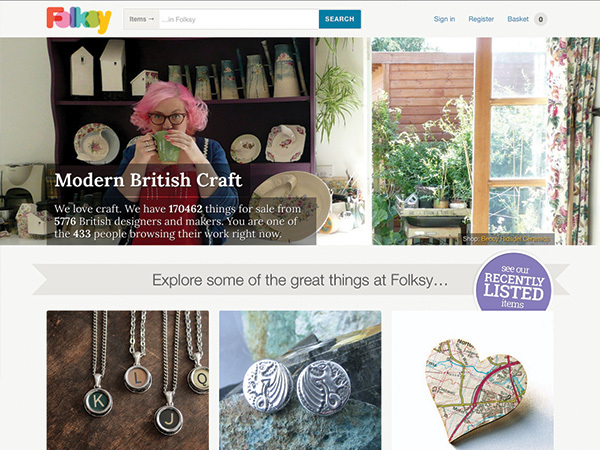 Plus, it’s a British website, so if you’re selling in the UK, it’s probably one of the best places to sign up to if you want to grow your craft business. 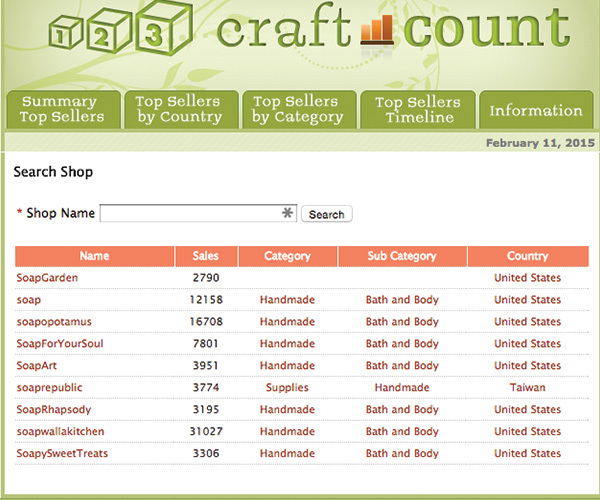 There are currently only 5776 sellers too, so there’s a lot less competition than on Etsy. Perhaps the absolute best way to take your craft business to the next level is to start selling your products via your own website. 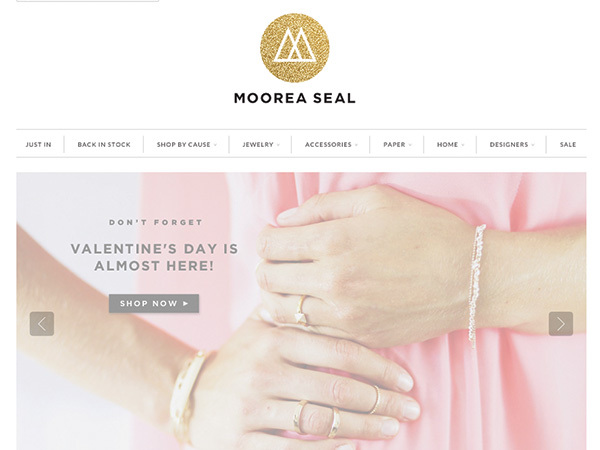 However, most people shy away from the website promotion process as they believe that they don’t have the technical knowhow to set up their own store. This might have been the case a few years ago but these days, setting up an online ecommerce store is easier than ever thanks to companies like Shopify. 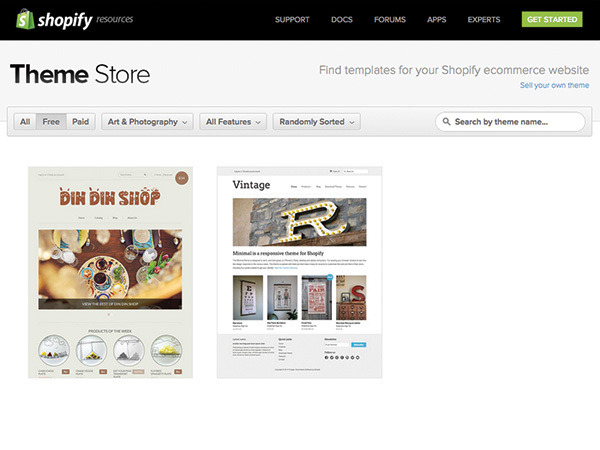 Shopify allows you to set up an online store in a matter of minutes. You’re also able to accept payments, use your own domain (website address) and much more. 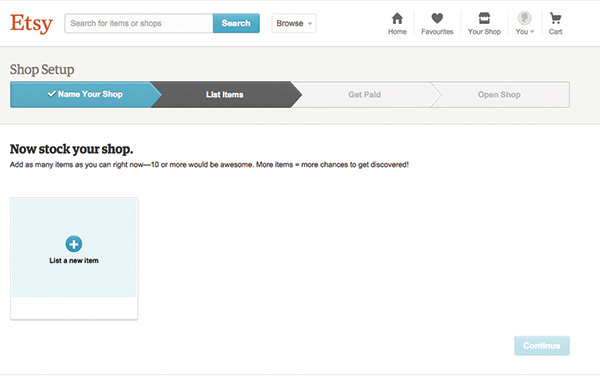 You can give Shopify a go free-of-charge for 14-days by signing up here. Just enter a store name, email address and password and you’re ready to start selling. Note: You will need to sign up for an account if you wish to use your own domain however, which starts at $29/month. With most craft business starting from home these days, most craft business owners tend to think on quite a small scale. There’s nothing wrong with this, especially in the early days, but it’s important to remember that just because you manufacture and sell products from home, you’re not limited to selling online. One tactic that can often send sales through the roof is to sell your product(s) at wholesale prices to retailers. This could be a small local shop in your town/city or it could be a national retailer; either way, it’s a good way to get guaranteed orders every week. 1.You sell your product(s) to retailers (e.g. local shop) for £5 (i.e. wholesale price). If you can negotiate a deal like this with a retailer, all you’ll have to do is deliver X amount of your product to them every week and collect the money. It truly is one of the easiest ways to grow your craft business. Unless you sign an exclusivity deal (which in most cases, you shouldn’t), you’ll still be able to continue selling online; you’ll just be able to target a different market segment by partnering with retailers. There you have it: the ultimate guide to growing your craft business. It’s important to remember that even if you follow everything above, it’ll still take time to grow your business. If you’re expecting the sales to start rolling in overnight and to start turning a heft profit within a few days, you’re in the wrong business. A craft business should be a labour of love. If it isn’t, or if you’re not sure that you’d still want to be running the business in 2 years time, it’s time to call it a day and find something you’re truly passionate about. Running a craft business is hard work and you’ll need to put the hours in (especially in the early days). But, if you follow the advice above and keep at it, you’ll have a successful craft business with a decent income in 1 – 2 years in most cases. Did we miss anything in the guide above? We hope not! If we did, let us know and we’ll make sure to add it.